I don’t usually post about financial things on this blog because I am no expert on the matter. However, in this case, I feel like I can keep others from making the same mistake as my husband and I have. Let me start off by saying never, ever take out a title loan or a payday loan. I know it’s tempting especially when you need money, like yesterday. These companies are predatory lenders. They prey on people who are financially strapped. Over the years my husband and I have used several of these at one point or another. We’ve always paid them off. Of course the interest rates are outrageous. You pay double what you borrowed. We have taken out payday/title loans because things have come up and we needed the money at the time for bills. I should add that my husband has a job where he gets paid hourly. Sometimes he has short weeks and doesn’t make as much. His checks can vary by at least $200. So it’s hard for us to budget. I’m not saying impossible, but difficult. This is NOT a post where I want anyone to feel sorry for me. I just want to warn other people so they will steer clear from companies like this. Back to the original story. My husband was supposed to go in on the 6th and pay it off, but it completely slipped his mind. We’ve had to deal with some things going on with my stepdaughter so we are a bit stressed. The manager of this particular title loan business called my husband this morning and they verbally agreed that he would come in on Thursday at 9:30 and pay the car off. Around 30 min later, someone drives off with the car. No knock at the door or nothing. My husband had to go find the car so he could get his work tools and badge out. He is then told he not only has to pay the car off but also the repo fee in order to get the car back. They told him he has until Thursday or they will sell the car. With the way they are doing business, I don’t trust that,but we won’t have the money until Thursday. I did some legal research and found that in the state of Mississippi, a verbal contract is legally binding. However, when he told the manager this, the manager said it wouldn’t hold up in court. Oh how I wish I had an attorney friend who could call and tell him he was wrong. I am sure these places know the laws though and they probably skate just about what’s legal to get away with things like this. I realize some of you are thinking “Man, they are so stupid.” or “I’d never do that.” That’s fine. This post is not for you. 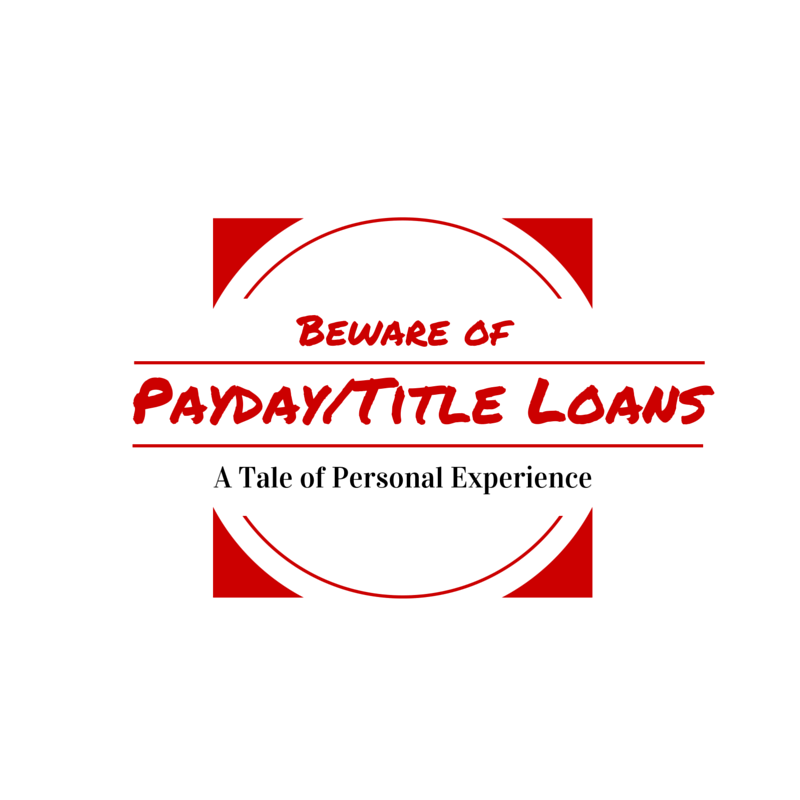 It’s for those who are thinking about using a payday/title loan service. These businesses know that once you get in that cycle, it is very difficult to every pay it off. That’s how those businesses thrive. I wish I had advice for those of you who are struggling financially and considering borrowing from these places. I would say borrow from a reputable source such as a bank. But when you have bad credit, that’s not an option. I would say the best option, if you need money to pay a bill, ask a family member and make sure you pay them back. I hate borrowing from family, but it’s better than getting taken to the cleaners by shady lenders. Again, this post is not an attempt to get people to pity me. But if I can at least help one person with this post, then that is good enough for me. That’s what I want. In my opinion, these places should be shut down. Their interest rates are ridiculous and their tactics are less than honest. I don’t see how anyone with a conscience could own a business that takes advantage of people like that. I guess the love of money is greater than the love of people. Stop being a people pleaser. Seriously. Just stop. You will never make everyone happy. There will always be people out there who won’t like you, no matter what you do. I’ve found this out time and time again. It seems people only like you when they can walk all over you. Then guess what? You are the one who is stressed out and miserable. Yes, when you finally say “enough!” and stop allowing people to take advantage of you they will more than likely get angry with you. They may even spread rumors about you to who ever will listen. But in the long run, you will be happier. There are some people who will use you and act like your friend. They will act that way until you no longer do exactly what they want, then they will turn on you like a snake. That’s ok though. Think about it, is that the kind of person you really want in your life? Most of the time, those kinds of people never do anything for you anyway. They are “takers” and that’s all they know how to do. And if you’re a “giver” like me, you seem to attract those kinds of people from miles away. I’m not exactly sure what kind of vibe that “givers” exude, but it believe me, the “takers” can usually see it right away. They know who they can take advantage of and who can see right through them. And I know, when you’re a “people pleaser” it’s so difficult to say “no”. You don’t want people to dislike you. But if you even think a situation might bring stress to you, just politely decline. You don’t even have to give a reason. Just be nice and let them down easy. You may feel bad for a little while, but it will save you a lot of headache later on down the line.